"Tim, you know one of the things that will be a real achievement for me is when I get Apple to build a big plant in the United States, or many big plants in the United States," recounted Trump to the New York Times about the recent call with the Apple CEO. "Instead of going to China, and going to Vietnam, and going to the places that you go to, you're making your product right here." According to Trump, Cook's only response was, "I understand that." 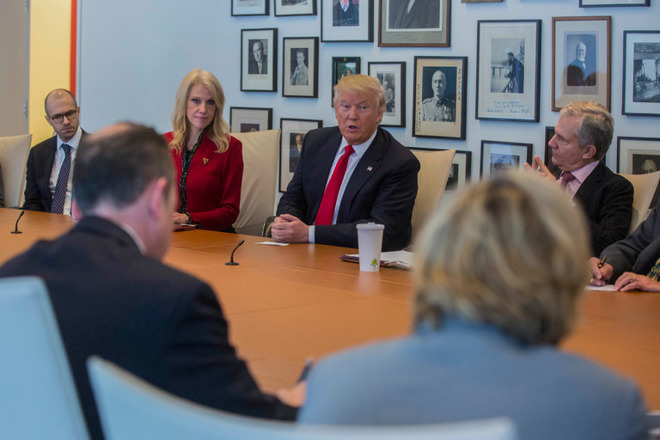 "I think we'll create the incentives for you, and I think you're going to do it," added Trump. "We're going for a very large tax cut for corporations, which you'll be happy about." In the portion of the conversation related to Cook and Apple, Trump also pointed to his view that a "choking" overly regulatory environment within the federal government is responsible for a poor start-up climate, and hampers expansion. "I've met so many people. They are more excited about the regulation cut than about the tax cut," said Trump. "And I would've never said that's possible, because the tax cut's going to be substantial." Trump added that the reaction to regulatory reduction was surprising to him, and "more enthusiastically supported" than large tax cuts.